Ok, so I’ve never written a blog post before. My first reaction is to behave as if I am publishing all of the world’s research on intention from the beginning of time. Of course, the achiever in me wants an A++! I determined that before I began I should formally define “blog”, identify its structure, learn tips on how to write a successful post, and read every blog ever written. Whew! But, I refrained. If this is for MY community, it needs to come from my thoughts, my experiences, and my heart. These are things I have discovered through my own journey of healing and personal growth. I collectively credit all of my mentors near and far. It started several years ago when the experience of my second marriage had turned me into someone who was not…ME! My daily monologue was, “I am not this person.” I was in complete despair. I was physically ill and in so much emotional pain that I was sure I was going to die. I was in crisis. Survival mode kicked in and I realized the only way to survive was to “do my work.” I began studying, journaling, crying, praying, studying, journaling, and crying. I spent months filling notebooks with things I wanted, steps that needed to be taken, the ways I wanted my next decisions to improve my situation and the well-being of my family members. I was setting intentions for my LIFE! 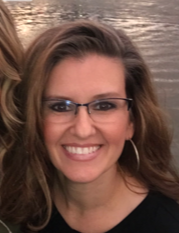 I want…I need…I will…I must…I can no longer accept…I must let go of…the vision I have for myself is… how I want to feel is…who I want to be is…how I show up for my kids and my team will be… This process ultimately helped me get unstuck and back to my normal. So, I’ve been out of crisis mode for quite some time now and I have come to know that intention is a true gift. I no longer set my intentions out of desperation. It is an ongoing practice that guides me and moves me forward to where I want to be. The beauty is that we can set intentions for whatever we want no matter where we are in our lives: Intention for growth, abundance, healing, personal development, nurturing relationships, creating moments rather than going through the motions, for understanding, for how you want to show up today, or who you want to be in the world. Between my upbringing and our culture, I used to be “goal” driven. Go go go, get get get, push push push, more- better- best! Understanding what “intention” means has allowed me to shift my perspective on achievement – moving me from a “self” mentality to “serve” mentality. “Goals,” as I understood them before the mindfulness movement, are often sought outwardly, creating a sense of pressure within us and disappointment or punishment if we fail to reach them. 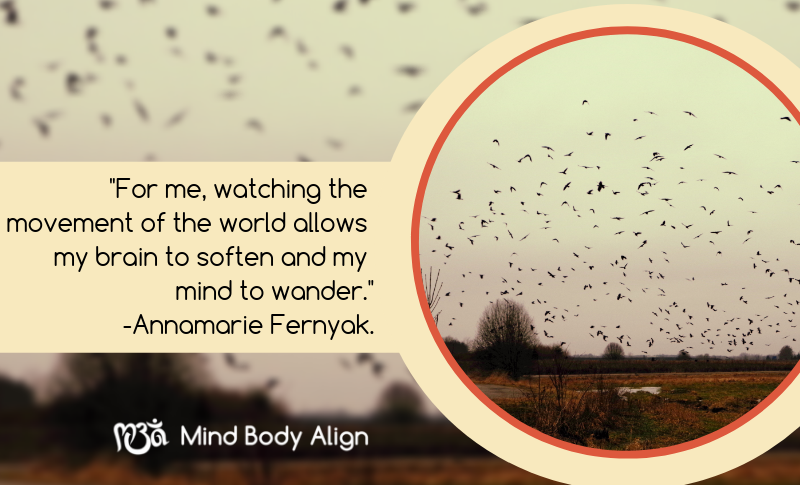 For me, intention equals freedom – a knowing as opposed to uncertainty. I literally feel my physiology change when I say each word in my mind. When focusing on intention I feel a huge expansion bringing me to center. It feels vast and limitless. It helps me reconnect with that which is bigger than myself. It gives me confidence knowing “I’ve got this.” It helps me focus less on expectation and how others perceive me. It has changed how I view myself, the world, humanity and beyond. I feel a little, girlish giggle on the inside knowing it’s all mine. Like I have a secret no one knows. I can have it right now, in any way I want to…to nurture it, hold it, and appreciate it. It is faith instead of worry. Unlike a goal we set outside of ourselves, there is peace in intention. 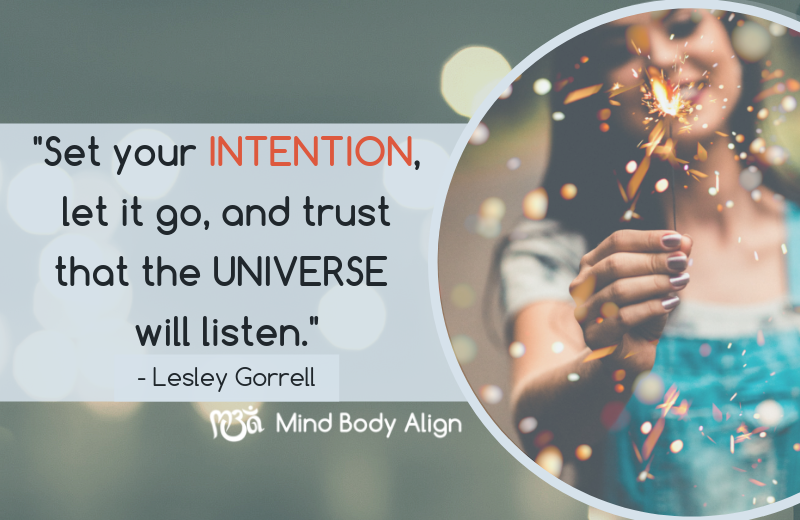 Set your intention, let it go, and trust that the universe will listen. Revisit your notes periodically as a reminder of where you want to go and who you want to become. I like to do a Sunday review. For me, it is a good day for reflection and renewal. I have used pop up reminders on my phone with power words or phrases during particularly difficult times. Find what works for you. Be open. Put it out there, stay focused, be consistent, hold it in your heart, and be prepared to receive your gifts in unexpected ways. I am a current Psychology student at NC State College and online student of Brendon Burchard learning self-mastery and high performance. I am a 28 year resident of Galion, Ohio. I have worked in the staffing industry for 13 years. I have 2 children, 2 grandchildren, and 2 pets. 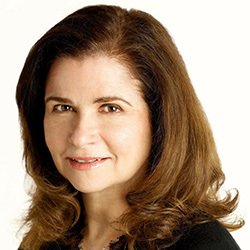 My passions are Neuroscience, Positive Psychology, and Human Behavior. When I got the email from Diana Hostettler at Mind Body Align to write a blog on Setting Intentions, I was flattered and terrified. I can get up and speak ad lib in front of 100 people but to put my thoughts down on paper makes me panic. However, in the spirit of all that I have learned at MBA, I felt I had to accept the assignment. What is “setting intentions?” Are “intentions” like the resolutions we make in January every year that we never keep? Are “intentions” like those punishments we use to make sure we lose the weight we gained from eating the delicious food during the Holiday season? 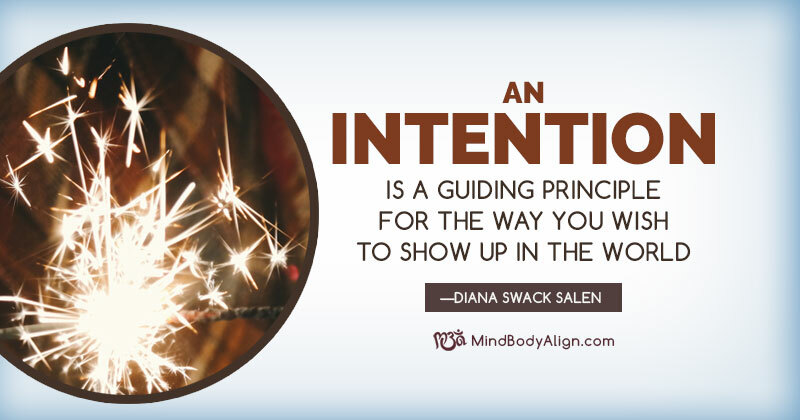 An intention is a guiding principle for the way you wish to show up in the world. When you set an intention, you are activating your receptivity. If you go out in the day without setting one, it’s like you are riding a bike with no direction. When you do set an intention, you are putting out that which you intend to attract into your life. But how do we get there? How can we connect to our inner wisdom to chart our course for 2019? Since I didn’t know the answer to my question, I did research on this subject. There was a lot of guidance explaining how to set intentions, but I liked the information from Deepak Chopra, which I’ve paraphrased below. Chopra states that “the sages of India observed thousands of years ago that our destiny is ultimately shaped by our deepest intentions and desires.” Here are the five steps in his book, The Seven Spiritual Laws of Science, to help us harness the power of intention. Release Your Intentions and Desires: Once you’re established in a state of restful awareness, release your intentions and desires. The best time to state your intentions is during the period after meditation. After you set your intention, stop thinking about it and let it go. Remain Centered in a State of Restful Awareness: Let your intention go into the positive vibrations of your meditative state. Let your higher self take care of the outcome. Let the Universe Handle the Details: “Your focused intentions set the infinite organizing power of the universe in motion.” We don’t know what the outcome will be. Many times we have a plan in mind and our higher power sends us something better than what we had envisioned. When you are working on your intention, make sure you keep it positive. Instead of saying I want to take off these ugly 10 pounds I stupidly gained—try the more positive version—I want to love my body and eat healthy food that nourishes it. Your intentions can change and evolve. Many people find it helpful to keep a journal to decide what intentions are meaningful for them. You can also write about your outcomes after you start doing this. I love reading old writings to see how I’ve evolved and grown. It can be amazing to see how things that upset me in the past have been healed. I’m glad I took the challenge to write about “setting intentions.” I thought I knew a lot about this subject, but I really didn’t. Now, I have a roadmap to help me bring this into my daily practice. One of my new intentions will be to face challenges in a positive way. Writing this blog was a significant experience and I highly recommend it to others who may be asked to contribute. I love being in Mansfield…the sense of community is very special and there are so many opportunities to contribute. I’m a Mansfield native who has lived in New York City for over thirty-five years. I now live half my time in Mansfield since I joined my family’s Affordable Housing business, The Provident Companies, in 2015. In New York, I was a sportswear designer and then owned Diana & Jeffries, a women’s clothing boutique on Madison Avenue for twenty-six years. I have an adult daughter, Sofia, and a partner, David Grupper. I’ve been able to develop my spiritual side in Mansfield and have become a Reiki master. I also enjoy riding on the bike trail, traveling, cooking, theatre and listening to live music from rock to classical.